What is a Story Telling Game? How is One More Story Games not just another gaming platform, but designed for readers and authors? How does One More Story Games transform a linear story line into an interactive game? How is One More Story Games a mixture of gaming and storytelling for writers and readers? How can using One More Story Games tie into an author’s work? How can One More Story Games give the reader a new and interesting experience in the story worlds writers create? 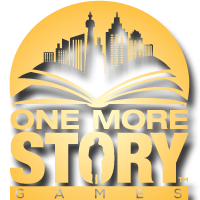 Is One More Story Games just for Mystery Writers?